Ron Burkle didn’t score a goal during the Penguins’ drive to the Stanley Cup this spring. Didn’t make a save, either. And if he hit anyone, it didn’t show up in the official stats. But while Burkle didn’t crack the scoresheet in any of the team’s most recent championship runs, a case could be made that, along with fellow owner Mario Lemieux, no one – not Sidney Crosby, not Evgeni Malkin, not Mike Sullivan, not Jim Rutherford – is more responsible for the success the Penguins have enjoyed during the past decade. In part because the city probably wouldn’t have an NHL franchise without him. Burkle, a 64-year-old billionaire based in Beverly Hills, agreed to partner with Lemieux when he was trying to get control of the team out of bankruptcy in 1999, and subsequently has provided the financial stability that allows the franchise to be a perennial contender. “Ron is one of the main reasons we still have hockey in Pittsburgh,” Lemieux said. “If I was not able to buy the Penguins and have Ron as our top investor, I don’t think the Penguins would be here today. Burkle, however, has long preferred that most people not know much about him. Aside from speaking with a couple of newspaper columnists when Ray Shero was fired as general manager in 2014 and making a few other random public comments, Burkle has maintained an extremely low profile. Nonetheless, Burkle recently granted the Pittsburgh Post-Gazette a wide-ranging, 45-minute interview at his residence in the SoHo section of Manhattan. It was, team officials said, the first – and last – such interview he will do. Although Burkle was exceptionally forthcoming and insightful on almost every subject raised — the birth of his partnership with Lemieux, the decision to explore selling their stake earlier this decade, the move to fire a key coach and executive, the slow development of the Civic Arena site, even Donald Trump — he said there is nothing to be gained by him assuming a prominent public position. That makes Burkle an interesting partner for Lemieux, who actively avoids the spotlight, too. Determining which would prefer to be further from the public eye is not easy. In 2006, Burkle battled a New York Post gossip columnist over publication of unverified reports about his personal life. At one point, the FBI got involved over the claims, which Burkle has vehemently denied. That's an indication of the lengths to which he will go to keep his private life out of the public eye. Regardless of how Burkle actively avoids the spotlight, his players are adamant that he merits more credit for what the Penguins have achieved than he generally receives. “He and Mario are both really supportive, but I think they do it because they care about the team,” captain Sidney Crosby said. “They don’t necessarily need the attention or need everything that comes with it. For nearly a decade, Burkle was a classic silent partner for Lemieux, contributing capital but avoiding hands-on involvement. That began to change early in 2009, when Burkle believed the team was underachieving and Michel Therrien – for whom he expressed great respect and affection – had to be removed as coach. Dan Bylsma replaced Therrien in mid-February, and the Penguins won the franchise’s third Stanley Cup a few months later. But even after he began to have input on major decisions, Burkle remained a silent partner in the most literal of senses. The people who are there, though, are quick to point out how much Burkle has contributed. Burkle’s fortune has been estimated at between $1.5 billion and $3 billion, which is not the kind of wealth a person accumulates one cent at a time. That doesn’t mean Burkle, a divorced father of three, wouldn’t be willing to try. “I’m superstitious,” he said. “I can’t believe how lucky I’ve been, so I won’t walk past a penny. Burkle did not, however, become so well-heeled by collecting loose change in restrooms. Although those deals helped to generate incredible personal wealth, Burkle hasn’t lost touch with his blue-collar roots. Tangible evidence of that can be found on one of the conspicuous examples of Burkle’s wealth: His private plane, a customized Boeing 757 whose identification number is BB770. He certainly gets along well with his employees who are members of the NHL Players’ Association, in part because Burkle routinely spends as much money as necessary to maximize the Penguins’ chances to succeed. 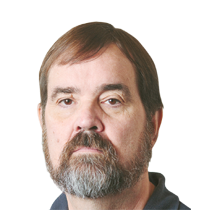 “Anything the hockey department wants, whether it’s in the form of money to sign a player or hockey staff or make things the best possible for our players, he’s never said, ‘No,’ ” Rutherford said. “He never hesitates. That, team president and CEO David Morehouse said, reflects Burkle’s approach to all of his businesses. Burkle noted that the NHL’s salary-cap system limits how much a team can spend on players, but that there are no restrictions on what can be invested in things such as practice facilities and front-office staffers. In August of 2008, Burkle flew from Europe to Nova Scotia to attend a surprise 21st birthday party for Crosby. That was a pretty good indication of the regard he has for Crosby. Crosby certainly appreciated it – “I did not expect that,” he said. “To see him and Mario and his family show up was pretty cool” – but his most vivid memory of the event might be what Burkle was wearing. That’s not something Crosby should expect to happen very often. Indeed, Burkle dressed up for the party, which was attended mostly by people in casual summer attire, simply because he didn’t know any better. “He didn’t get the memo on that one,” Lemieux said. Indeed, those who know him agree that Burkle puts one on about as often as rugged winger Tom Sestito made it onto the Penguins’ power play last season. Which is to say, almost never. He’s partial to Ralph Lauren polo shirts – black ones, to be precise – and blue jeans. On one of the bookshelves that hold memorabilia in his SoHo residence, Burkle displays a gift he received from Lauren: A glass case containing a black polo shirt, with handwritten instructions to break the glass, in case of emergency. “Even Ralph Lauren makes fun of me for wearing Ralph Lauren,” he said, smiling. Based on what transpired during an event organized by former Google CEO Eric Schmidt, that trait seems to run in the Lauren family. “Eric Schmidt has this retreat every year … for the 40 most interesting people, according to him,” Burkle said. “I quickly pointed out that it’s at my place, or I wouldn’t be there. The gag gift from Ralph Lauren is displayed in an area off the living room of an apartment that is simultaneously welcoming and imposing. It is many times the size of a typical New York apartment – most tenants in the city don’t have a private rooftop pool, either – but its elegance is understated. The man who stays there occasionally is phenomenally wealthy, but doesn’t make an ostentatious show of it. What’s more, his demeanor during the interview, which was conducted with Burkle at one end of a large leather couch and his questioner at the other, was as relaxed as his clothing of choice. He smiled easily and often, volunteering details and insights he had no obligation to offer. Burke’s sense of humor was sharp, and he had no qualms about telling self-deprecating stories. He came across as the kind of person it would be nice to have living next door, regardless of whether he could buy the entire neighborhood out of petty cash. “As wealthy as he is and as good as he is in a board room, he is most comfortable in jeans, his black polo and with friends or family,” Morehouse said. Mario Lemieux’s partnership with Ron Burkle was forged during a meeting at the West Palm Beach airport in 1999. A couple of mutual acquaintances – Tom Reich, who was Lemieux’s agent for most of his playing career, and Tony Liberati, a Penguins executive when the team was owned by Edward DeBartolo and a longtime friend of Lemieux’s – had brought them together, believing Burkle might be a good fit for the ownership group Lemieux was trying to assemble to get control of the franchise out of bankruptcy. Probably more than they could have dreamed. “Mario and I met and hit it off incredibly well,” Burkle said. “We might have gotten [an agreement] done in 15 minutes. It just worked. Lemieux suggested that it actually took a little more time to strike a deal. But not much. “It was a half-hour meeting,” Lemieux said. “And he was my partner. Smart enough to craft a deal that served Lemieux – and himself – well. “It was an incredibly unique situation, obviously, where he’d been advised to defer everything [in terms of his salary as a player] forever and he deferred everything forever and then they couldn’t pay him,” Burkle said. “That was probably an opportunity, just in terms of a business transaction that you wouldn’t see again. Burkle and Lemieux not only are business partners, but friends who speak of each other in the warmest of terms. Even so, their professional relationship could have dissolved a few years ago, when a decision was made to put the franchise – or, at least, part of it – on the market. Lemieux, Burkle said, was wondering if it might be time to largely separate himself from the Penguins, with whom he had been associated since 1984. “I came in with Mario, and I always promised that I’d go out with him,” Burkle said. “I’d either buy him out or I would go out when he went out. I would like to own the team forever. That would be my wish. There were “a lot of options” to get Lemieux some money for part of his stake while the duo retained control of the team. Eventually, they settled on one to explore. There is, Burkle added, no reason to believe that will happen, because he has no interest in selling his share of the Penguins. He doesn’t believe Lemieux does, either. “I personally don’t,” he said. “I don’t think [Lemieux] has any. I think he has balanced, in terms of how much of his life is the Penguins now. I think he’s much better balanced than he was before. “All the kids were leaving the house and he had a big home up in Canada. ‘Should I go live there full-time?’ or ‘How much time should I spend in Pittsburgh?’ Now, he’s remodeling the house in Pittsburgh. While Burkle’s wealth is a testimony to the many triumphs he has had in the business world, only one deal, he said, generated feelings that rival those inspired when the Penguins win the Stanley Cup. That was when he purchased a grocery chain, Alpha Beta, that had been an intense – and more successful – rival of the Stater Bros., with which he’d had his first job. It meant so much to Burkle that he labeled the work that went into arranging the acquisition “Project Blue Coats,” because Alpha Beta store managers wore blue coats and focused on managing, rather than taking the hands-on approach of their Stater Bros. counterparts. Conversely, it has been just weeks since the Penguins claimed the franchise’s fifth Cup – and the third under Lemieux and Burkle. Burkle clearly relished everything about it, but the highlight he singled out might not have been the most predictable one. He had enjoyed similar celebrations in 2009 and 2016, but suggested the latest championship was the most satisfying because of all the adversity the Penguins overcame along the way. And because of the way Fleury, who was claimed by Las Vegas in the expansion draft days after the Cup was won, subjugated his personal interests to benefit the team. Fleury agreed to waive a no-movement clause in his contract and be exposed in that draft, which made it possible for him to remain with the Penguins and enhance their chances of earning another title. “This year was incredibly fun, because you’d read the injury reports every day and you’d think, ‘How does anybody go out there? It’s just unbelievable,’ ” Burkle said. “The number of people who had ‘Treat and Play’ after their name every morning and then, after practice or after a game, there are more of them. “I’m a huge fan of [Kris] Letang, personally and on the ice, and I thought, ‘Well, without Letang, how are we seriously going to get there?’ So this one had its own reasons to be incredibly fun and rewarding and exciting. We won with all the adversity, we won with all the injuries. “And then, what Fleury did for us by being more of a stand-up person than you could ever imagine anybody being and [Rutherford’s] call to keep him all year, which was exactly the right thing to do – I wish we could have given the $15 million [expansion fee] back and kept him forever. The Penguins aren’t the only sports operation in which Burkle has had a financial interest. He has owned a share of soccer’s Los Angeles Galaxy, and has invested in auto-racing and boat-racing teams, as well. He reportedly made an unsolicited offer to buy the Pirates in 2010, but declined to confirm or discuss it. But being involved with hockey never made it onto his radar until after one of his sons, John, and a nephew, Greg, embraced the sport. He added that the nearest ice rink at the time “was probably 40, 50 miles away” in Ontario, Calif. Coincidentally, though, an incident at that very rink when he was a boy left a lasting impression on Burkle. “It was the first time I held hands with a girl, and we were skating on the ice at the same ice rink where my nephew went,” he said. “She fell and I didn’t let go, and cut my hand open. Off the ice, Burkle recalls having a fairly modest athletic career. “I went through school really quick,” he said. “Not because I was really smart; I was just impatient, probably. And I was small. That limited background as a competitor doesn’t prevent him from connecting with the players who work for him. Even those who moved on years ago. Burkle’s primary residence is an estate in Beverly Hills, and he invariably invites the team to his place for dinner when it is playing in southern California. The visit always makes an impression. “It’s amazing,” Crosby said. “It’s a big house. A lot of land, a few guest houses. Some pretty unique things that he has, memorabilia and stuff like that. Burkle said the Penguins’ last visit to his home was part of a road trip on which they were accompanied by their mothers. That seemed to make it particularly special for him because his mother, Betty, follows the team passionately. “My mom is as big a fan as anybody I know,” he said. “She lives about 2½ hours outside of LA. She comes in and she gets excited. Though Burkle’s business interests take him around the globe, that doesn’t prevent him from keeping up with how the Penguins are faring. He makes a point of being at as many playoff games as possible, but his other obligations prevent that on occasion. That was the case in 2009, when he was in South Korea while the Penguins faced Washington in Game 7 of the second round. Burkle enlisted team officials to find a way for him to watch the game and, ultimately, they came up with a solution that involved connecting a laptop computer to a TV screen. He was out of the country during the Penguins’ playoff run in 2016, too. Well, for a little bit of it. 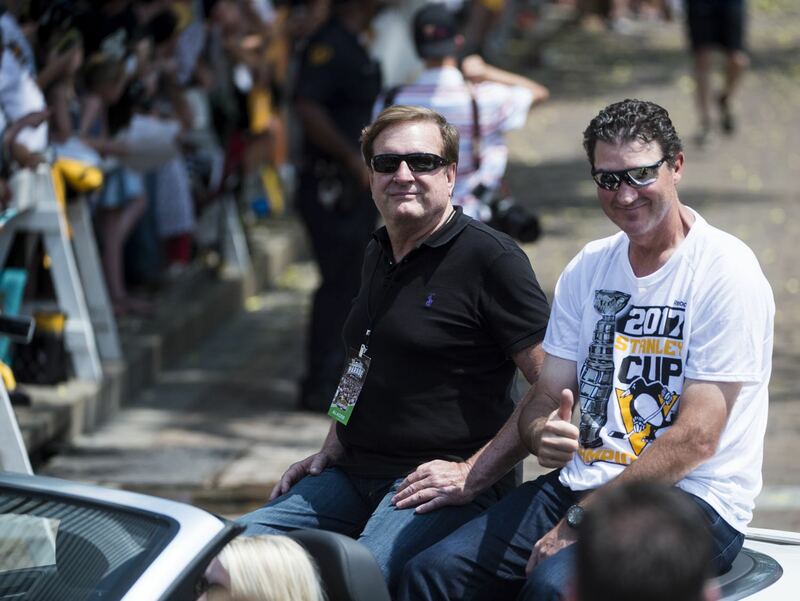 Burkle’s passion for the Penguins – and his pride in all they have accomplished during his time with the franchise – is readily apparent. Nonetheless, he was mostly detached from the operation of the team during his early years of ownership. That changed when he had major philosophical differences with then-CEO Ken Sawyer, who previously had been chief financial officer of the NHL. “I thought we were headed in the wrong direction,” he said. Plus, the team wanted a new building to replace Civic Arena. “I thought we were headed in the wrong direction because Mario, like almost everybody who’s got an incredible talent – whether it’s in business and you’re a great operator or whether it’s as a great player – when they get in the top position, they tend to lean on the CFO a lot, and the CFO doesn’t have a commitment to win,” Burkle said. Sawyer retired after the 2010 season, replaced by Morehouse, a man Burkle hired three years earlier. Burkle took an active role in the negotiations that eventually resulted in construction of the facility now known as PPG Paints Arena, and in abandoning – or, at the very least, accelerating – what had been management’s five-year plan for constructing a competitive franchise. “I just felt let we had a commitment to ourselves, because that’s the only reason, to me, to be in this business, if you want to call it a business, or passion, or whatever, is to win,” Burkle said. Burkle put his more aggressive approach into practice in 2008, when he approved upping the payroll to acquire Marian Hossa and Pascal Dupuis from Atlanta. When Shero, then the general manager, and his staff told Burkle that adding Hossa would make the Penguins a legitimate Stanley Cup contender, Burkle didn’t hesitate. The Penguins fell two victories shy of a championship that spring, but Burkle’s commitment to fielding a Cup-caliber team was cemented. Although Burkle doesn’t dabble in day-to-day issues, his stamp on the operation has been evident since he assumed a more active role nearly a decade ago. Burkle doesn’t prod Rutherford to make certain personnel moves, or suggest line combinations to Sullivan. Nonetheless, the instincts that have served him well in the business world also are apparent when he assesses his hockey team. Only a tiny percentage of Burkle’s net worth has been generated by the Penguins, but he said the franchise is a money-maker. “We’re a profitable team, under almost any scenario,” Burkle said. “From a budgeting point of view, we assume we’ll make the second round [of the playoffs]. “That’s kind of our baseline, when we look up what we can do over the course of the year without doing something unusual, capital-wise. We assume we’ll make the second round. The Penguins also stand to generate some income from the development of the former Civic Arena site, although that project has been running behind schedule. Burkle, though, said the delays don’t trouble him as much as some might suspect. Mostly because the revenue that could come from developing that site is not a primary concern for him. “I would never say that I was frustrated by it because part of my business philosophy – and my philosophy in life – is to remember what the goal is,” Burkle said. “Remember why you’re here, what you’re trying to do and remember what you’re headed toward. “We’re a hockey team and we want to win Stanley Cups. We want to have our players feel like they’re in the best place they can be, and we want our fans to care. Incidental to all of that, we have this piece of property over here that has some value to it. “We’re not going to be a typical developer, because we’re not going to do things to alienate the community to make an extra dollar. When you take that on, you kind of have to accept that you’re putting yourself in a little bit of a spot because your obligation is to do something that’s accepted by everybody. Burkle’s politics are decidedly progressive, and he has long been a donor to Democratic candidates. He makes no attempt to hide his leanings, even when it alienates customers of some of his businesses, as happened with a grocery-store chain in the West. “I do a lot of fundraising,” he said. “People would cut Ralph’s [loyalty] cards up ... if I had a fundraiser for a candidate they didn’t like. Burkle has known President Trump for years, but shares few, if any, policy positions with him. 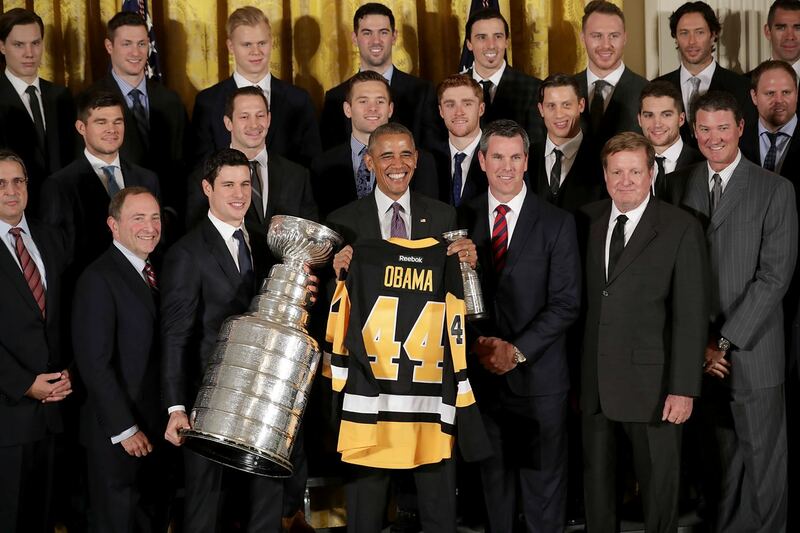 Nonetheless, he confirmed that he will not hesitate to accompany the Penguins to the White House, assuming they are invited in recognition of their latest championship. “I think it’s a tradition that should be honored, first and foremost,” Burkle said. “There’s a lot of emotion around the president. There’s a lot of negativity, and there’s a lot of passion. But it is the president, it is the White House. “If you want to protest, you can protest. If you want to be unhappy, you can be unhappy. If you want to voice your opinion, you can voice your opinion. But I, personally, don’t think this is the stage to do it on. If and when he returns to the White House, it won’t be the first time Burkle has toured a Donald Trump residence. It happened in 1999, as well, when Burkle, an architecture enthusiast, arrived in Florida for his meeting with Lemieux a few hours ahead of schedule and decided to use the time to tour a celebrated piece of property in Palm Beach.